After a long shift, your staff appreciates kitchen floors that are low maintenance and easy to clean—and during their shifts they appreciate the safety and durability of quality flooring. And that’s exactly why so many restaurants with Everlast® Flooring see noticeable increases in staff morale and efficiency, plus lower labor costs. 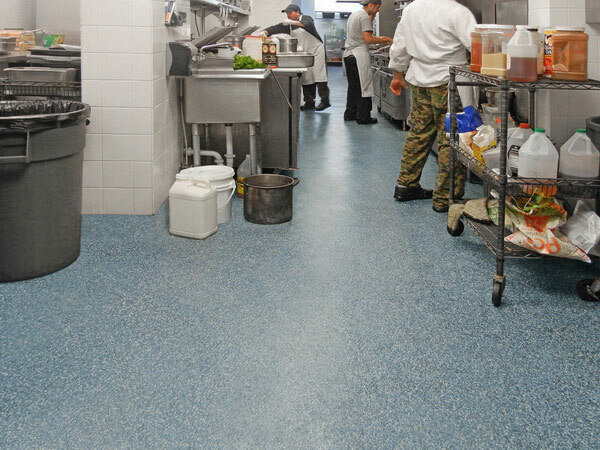 Kitchens are hard-hitting environments and our commercial kitchen floors can be quickly and easily installed while, at the same time, always adhering to high standards, including all state and local health regulations and codes. Everlast® Epoxy Flooring is a waterproof, non-porous surface and simple to clean. No more scrubbing and scrubbing….and scrubbing. Together with Everlast® Floor Care, dirt and grime "bead up" making it easy to remove. Simply use a deck brush to agitate the cleaner and dislodge dirt from the floor. After that, chase the used cleaner off of the floor with fresh water and a squeegee. It takes minutes and ensures your floors stay clean and sanitary for the long haul. Your new Everlast® Floor will be seamless and easy to clean. And it can be installed tight to the drains and up the walls to form a cove base, so there will be no crevices for unsanitary food particles and insects to hide. Everlast® Floor is an epoxy flooring made with an EPA-registered antimicrobial additive to restrict the growth of microorganisms. 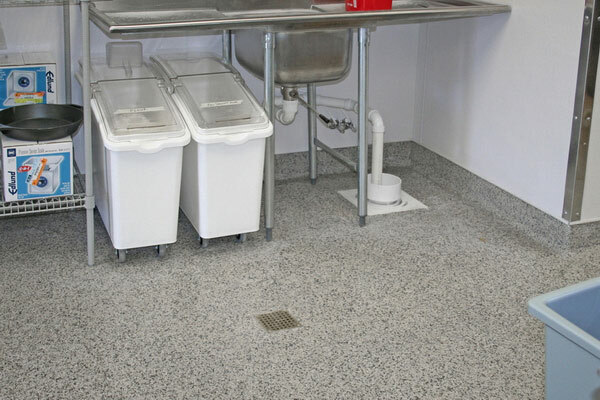 Other epoxy floors including quartz-filled systems typically use an antimicrobial layer that’s only on top. This surface protection, though, can easily be breached by hot oil and harsh detergents—something very common in kitchens. Our antimicrobial additive is integral to our epoxy system, with protection that goes deep—from top to bottom and everywhere in-between. And that means your epoxy flooring will be able to easily combat staining, mold, fungus, and foul odors now and years from now. And, better still, by following our maintenance guidelines together with our Everlast® Floor Care, your flooring won’t deteriorate, thanks to added protections against bacteria, viruses, yeast, and other microbes. With our unique antimicrobial additive, you’ll also have the added benefit of reduced odor that comes with bacterial degradation. And because Everlast® Floor is entirely seamless, there’s nowhere for dirt and germs to hide. Because Everlast® Floors are textured with marble chips, the final finish is pebbled, coarse and ribbed—but always non-abrasive. In drier spots within your kitchen, no additional grit is needed, as your floor will have non-slip properties from this natural texture. However, restaurant and foodservice floors are often coated in grease and oil, making them prone to slip and fall accidents. 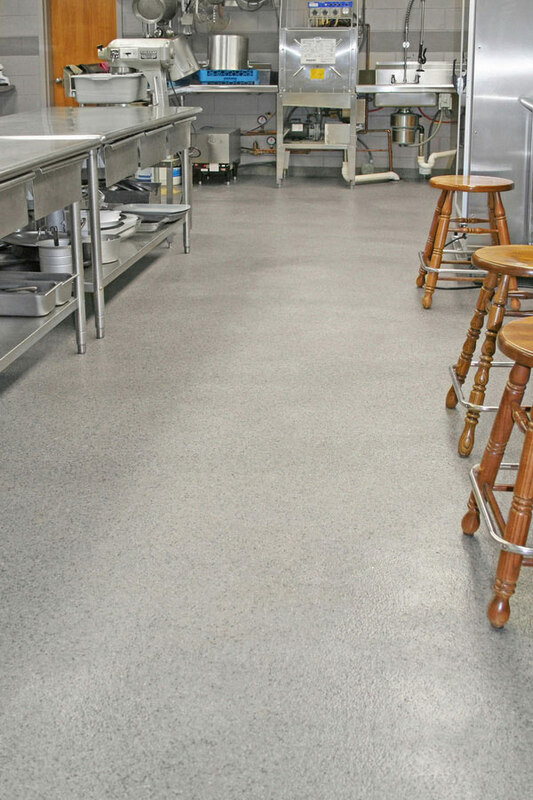 By integrating our exclusive coarse/kitchen non-slip additive, your kitchen flooring will be able to reduce slips even in slick areas, with a safe but extremely aggressive finish that keeps your workers on their feet. With this extra texture, coupled with proper cleaning, even a greasy kitchen floor can maintain slip resistance. Everlast® Epoxy’s resin-rich formula allows floors to seep into the concrete or wood substrate while curing, making it all part of the sub-floor. Your restaurant kitchen flooring will not crack and peel apart like epoxy floor paints or quartz broadcast floors often do, because our floors aren’t as hard and brittle as many epoxy options. 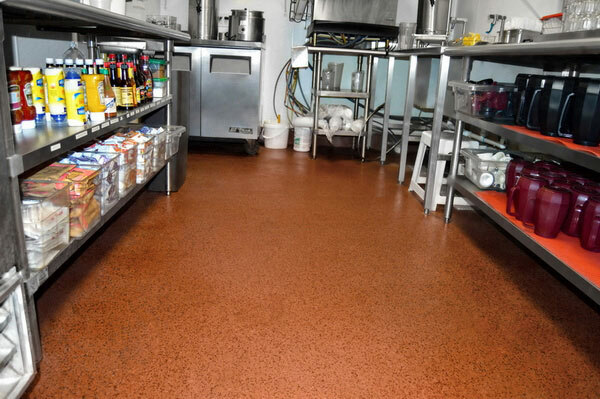 Your restaurant floors will have excellent chemical resistance against animal fats, grease, oil, many acids, alkali, sugar, blood, urine, salt, and harsh detergents and de-greasers. Not only is Everlast® Epoxy Flooring a great choice because of their safety and durability, but they also complement any kitchen decor or style. Choose from a wide variety of 42 colors that will compliment your space, or opt for a custom design featuring your logo, branding or other unique visual treatments. And because the color exists throughout our floors and not just on the top surface, your floors will never fade no matter how much foot traffic, spills and cleanings they endure. With these unparalleled kitchen floors, your space will be free of stress cracks, odors, bacteria and more—and will help keep your staff safe. 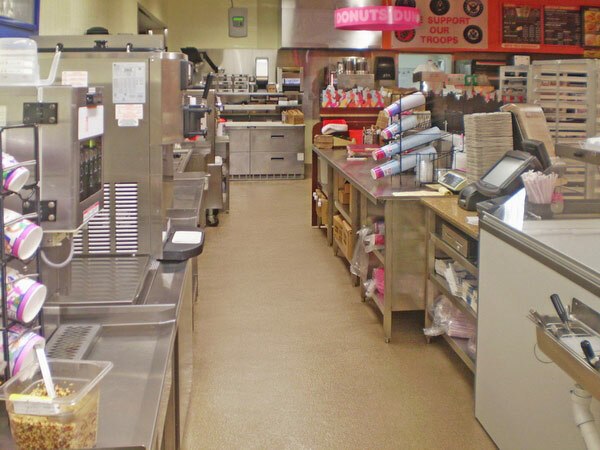 Commercial kitchen floors can take a beating—no one understands that quite like us. Call today for a FREE sample and estimate and learn more about our kitchen flooring options, installation process and pricing.